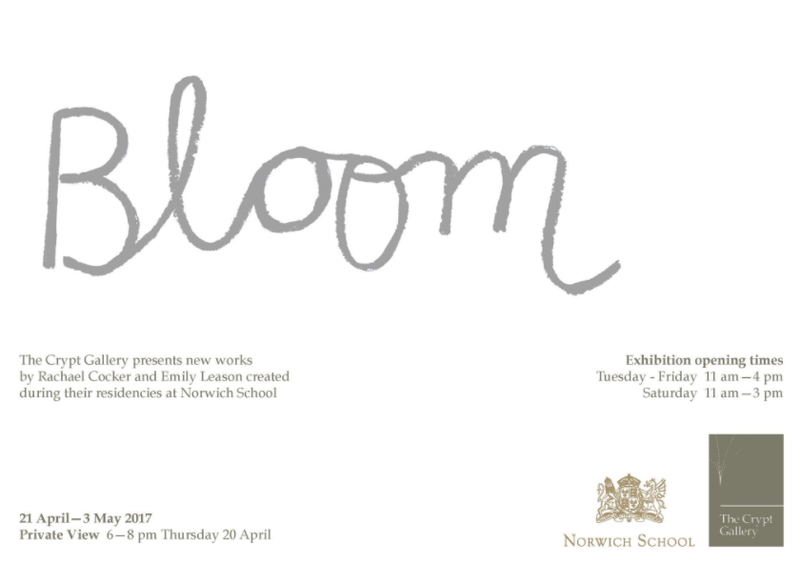 Rachael Cocker and Emily Leason presented work created during their residencies at Norwich School. The exhibition ran from 21st April until 3rd May 2017. Rachael Cocker is a Designer, Maker and Illustrator working in Norwich. She graduated from Edinburgh College of Art in 2015 with a first class degree in Illustration. She also makes work under the alias Herbert Green and enjoys making playful designs using a range of analogue processes. Her collection is entitled ‘Garlands: A floral celebration of the handmade’ which is a series of ceramics, textiles and screen prints. Of the exhibition Rachael says ‘I am intrigued by the endless representation of flowers in design, craft and folk art and so decided to take this well-trodden path to design my own collection of floral designs and patterns. Developed from immediate, gestural drawings and painterly marks, these designs express the spontaneity and energy which can only be achieved through making by hand. The bold, blue, abstracted flower forms were determined by surrendering to the drips, splashes, smudges, brush strokes and grainy crayon lines and playfully embracing these qualities. Moving across the three surfaces of clay, paper and fabric, this collection embodies the joy I find in making.’ Rachael is thankful she’s been able to develop her skills, particularly in printmaking and ceramics, thanks to the excellent facilities and technician support the school has offered her.